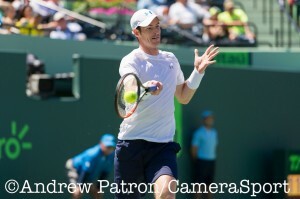 Tag Archive | "Miami Masters"
Two-time Miami Open champion Andy Murray has advanced to his fourth Miami Open final. The third seed took out Tomas Berdych 6-4, 6-4 to book a spot in Sunday’s finals. Murray will face the winner of the second semifinal match between 2014 Miami Open defending champion Novak Djokovic and John Isner. Murray last claimed the Miami title in 2013. Early in the tournament Murray claimed his 500 career match win when he bounced Kevin Anderson in the fourth round. Four time Miami Open champion Novak Djokovic met with the press in Miami after his doubles match with fellow Serbian Janko Tipsarevic. Djokovic responded to questions regarding his past wins on the ATP tour, social media, and his support for Tipsarevic while he has recovered from injuries. Q. You have won Miami back to back twice already. What’s the key for this quick turnaround? NOVAK DJOKOVIC: I started the season very well with winning Grand Slam, and that definitely helps my confidence level. I finished the 2014 season in a great form winning Paris and London back to back and then winning Australia and playing finals Dubai, Davis Cup, and then Indian Wells. Of course I’m at a great place now. I try to enjoy and take the best out of the feeling that I have on the court right now. Hopefully I can have another great week in Miami. The record that I had in last, you know, eight, nine years I have been coming back to Miami and playing the tournament is really good. Some of my best tennis I have played here in these courts. That can hopefully help me to get far in the tournament. We are here in United States for, you know, some of the biggest events we have in sport, Indian Wells and Miami for four weeks, playing best of three, and it’s well spread. It does help you to recover and get ready for the next matches. You don’t get too exhausted physically because the schedule is such that it allows you to have fun to recover and have time for the next one. Q. You know, Wimbledon has famous Kipling line of if you can meet with triumph and disaster, and treat those two imposters the same. Do you follow something the same? Is that how you keep your mindset, coming off a big win, as well? NOVAK DJOKOVIC: Yes. Well, you mentioned one very wise saying that you see just before you walk out on Centre Court. There is a lot of wisdom in that. Of course that’s easier said than done sometimes, but I guess you become wiser as you grow and as you become older, as well. Playing more matches and spending more time in the highest level in tennis allows you to understand, you know, how you need to approach and have the healthy approach to every tournament. Back in 2011 when I had the best season so far in my career and became No. 1 of the world, I was so much blown away and so happy by those terrific achievements that, you know, it was difficult for me the year after to kind of face all those challenges, to defend points, and was a little bit carried away by a lot of distractions, I would say, you know, off the court. But it allowed me those kind of experiences allowed me to grow and to become stronger mentally, you know, as a tennis player and as a person, and to find the right balance between the private and professional life, to enjoy the life that I have, to really embrace everything that life is presenting to me. But yet again, stay professional discipline, committed to the sport that I love. So I think right now I found the right balance, and I’m at the peak of my career and my abilities. Hopefully I can maintain that for the time to come. NOVAK DJOKOVIC: Well, let’s say I prefer the medium speed of the court. I think that it all depends if you’re playing during the day or the night. The conditions change. Of course the night, during the night, the ball travels through the air a bit slower and the balls get a bit bigger. Also, as you mentioned, because of the humidity it’s tough to physically stay out there and, you know, fight for every point. So you kind of have to be prepared that you have to face a certain kind of challenges. Swirly conditions today; wind, for example, that changes directions all the time. But it’s the same for you and your opponent. It’s just that, you know, you need to be tough and approach it in a right way. The experience of playing this tournament so many times helps me to approach it in that way and not get distracted by these conditions. Of course it is frustrating when you’re on the court, but more importantly is to stay concentrated. NOVAK DJOKOVIC: Well, I think the best thing about the social media and social platforms is the fact that you can interact with the people that follow and you support you. You know, there are many people around the world that actually, you know, watch tennis. It’s a very global sport. They support you and really express their love and appreciation for what you do. So this is one of the ways to give them back, not just on the court by playing good tennis, but also you interact with them and feed them with some video or picture content that would give them a different look at your personality. Not just what they see on the TV when you’re playing tennis, but something else, to present yourself as a person. Everything has its borders, obviously, but I try to, you know, kind of post most of the content I post is something that is fun, something that is different. You know, sometimes I have to show them that I’m working in the gym or on the tennis court, that I am preparing myself. But mostly some other fun stuff for people that I get to meet along the way. Q. And the bad side? Do you get mean messages? NOVAK DJOKOVIC: Yeah, I do. Of course, in the ideal world everybody with love you, but it’s not like that. I respect everybody’s opinion and freedom to say whatever they think. Actually, it’s good to read criticism in some ways, because you can have a different angle of observing yourself, as well, different perspectives. That’s how I see it. NOVAK DJOKOVIC: Well, it’s difficult to compare any of those seasons with this season, as well. Every season brings something new, new challenges. Right now I’m a complete person and really fulfilled in every aspect of my life. Became a husband and a father in last 10 months, and that’s a very important milestone for me that has definitely contributed in a positive way to my tennis, as well. I’m not taking things for granted. I am very grateful for the opportunity to play the sport that I love, and still kind of fulfill my parental duties and, you know, be, I would say, accomplished as a husband and a father. I cannot complain. It’s a great place in my life where I am at the moment, and trying to take the best out of it. Q. After so many years you stay on the top of tennis, how can you handle the fame, but on the same time, to be a humble person that you are? Can you send some words for the people who follow your career? And in Miami, people love you. cultural, very international city, Miami. There is a lot of Latin people. I feel over the years I have had a very nice relationship with the people from Latin America. Hopefully they will keep on supporting me. It’s very much necessary here. And referring to your first part of the question, as I said before, I really appreciate the fact that I’m playing tennis. Probably the childhood that I had, the circumstances in life that I had to face and overcome to be where I am at this moment allowed me to observe things in life in a different way, in a more humble way, I would say. The fact that I come from a very small country, the fact that I overcame some challenges that seemed impossible at the time with the war and sanctions and all these things and arrived to where I am, that has shaped me as a person and my character, and helps me now to have this kind of approach that I believe is the right one. Q. Can you just talk about the emotions you’re going through in supporting Janko over these years. tiebreaker, I have to say, because it was a very tough match. We lost to two of the great, very good doubles players. But we talked after the match, and he appreciated the fact that he can actually play. Just feel that match play, you know, have that sensation of how it feels and what takes to be on the court. 17 months is a long time for injuries, and he’s also not young. You know, he’s now 31 this year. But he’s eager to play. He’s motivated. He right now has been practicing for a couple of weeks 100%, and he decided actually it’s better to skip this tournament in singles because he needed a little bit more time to get into it. Hopefully this doubles match today can help him. When he plays now in Houston after Miami he can perform his best. He can relax. He has the quality to go back to where he was. You know, that’s top 10. I really wish him that. 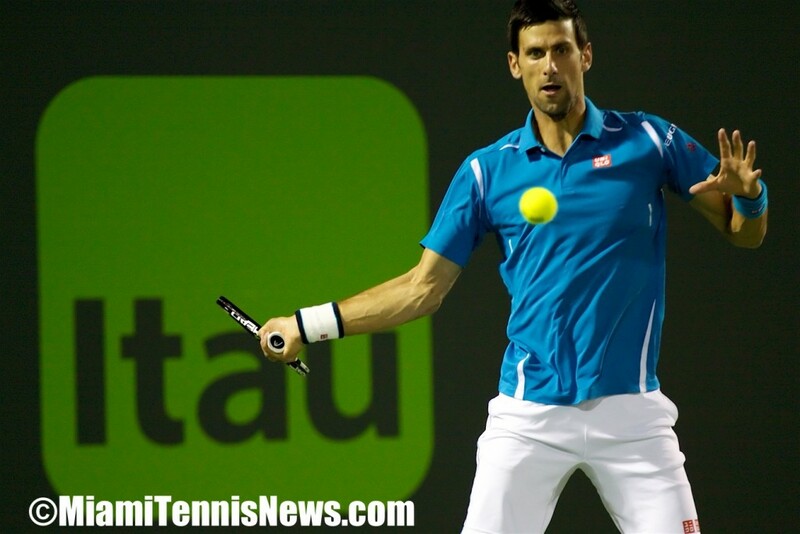 The 2015 Miami Open is set to take place from March 23 – April 5. Today, the tournament announced the field of players that will be taking to the courts at the Crandon Park Tennis Center. Novak Djokovic and Serena Williams will both be returning to Miami to defend their titles from 2014. From the ATP, Roger Federer, Rafael Nadal, Andy Murray and Juan Martin del Potro are also on the acceptance list. From the WTA, Maria Sharapova is still looking to claim her first Miami title. Victoria Azarenka and Petra Kvitova are also on the roster. A complete rundown of the acceptance list is provided in the tournament’s press release below. MIAMI, Fl. (www.miamiopen.com) – The Miami Open may have a new name, but the Grand Slam-quality player field it delivers each spring remains the same. The event received its 2015 official acceptance lists from the ATP and WTA tours and, once again, the line-up is unrivaled among tour events. With 74 of the top 75 ranked men, including all of the top 50, and each of the top 75 ranked women, the Miami Open player field ranks best on the tennis calendar. The 15 combined Grand Slam Champions, seven men and eight women, scheduled to compete at this year’s tournament are more than any other event on the tours outside of the Grand Slams. Whether you are looking to see a future Hall of Famer, a multiple Grand Slam champion, or a rising star, all will be on display at the Crandon Park Tennis Center during the event’s two weeks, March 23- April 5. 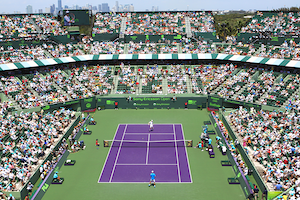 Tickets to the 2015 Miami Open are on sale now and can be purchased by phone (305-442-3367) or online at www.miamiopen.com. An exhilarating two weeks of tennis, fashion, food and fun conclude with the women’s final on Saturday, April 4 and the men’s final on Sunday, April 5. Individual session tickets start at just $31 and packages begin at only $136. Don’t miss the chance to be a part of the most glamorous event on both tours. The 2015 ATP acceptance list features World No. 1 Novak Djokovic, a seven-time Grand Slam winner, the defending Miami Open champion and reigning Australian Open champ; 17-time Grand Slam champion, Roger Federer; 14-time Grand Slam winner, Rafael Nadal; two-time Grand Slam and Olympic Gold Medalist, Andy Murray; and former US Open champion, Juan Martin del Potro. The women’s field for 2015 is fierce, featuring 19-time Grand Slam champion Serena Williams, who is the defending Miami Open winner and became the winningest player, male or female, in tournament history when she captured her seventh Miami Open title last year. Seven-time Grand Slam Champion Venus Williams, five-time Grand Slam champion and reigning French Open champion Maria Sharapova, two-time Grand Slam winner Victoria Azarenka and defending Wimbledon Champion Petra Kvitova are also entered to compete. Fans will also see last year’s break out stars Stan Wawrinka, the 2014 Australian Open champion, and Marin Cilic, the surprise winner at the US Open as they make a run for the Miami Open title. On the women’s side rising stars Eugenie Bouchard, a 2014 Wimbledon finalist, and American Madison Keys, who made her first semi-finals appearance at a Grand Slam at this year’s Australian Open, will also be in action. The Miami Open is more than just a tennis event. Located in one of the world’s most beautiful vacation destinations with a diverse fan base and exquisite dining and luxury shopping offerings, the Miami Open has an energy and excitement that is uniquely Miami. Qualifying rounds will be played March 23-24 and will determine 12 additional slots in each singles draw. 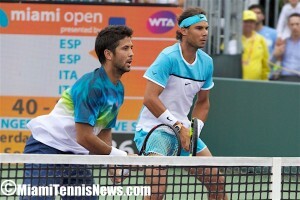 The Miami Open will also award wildcards to five men and eight women. The main draw begins on Tuesday, March 24 as the women take the court, followed by the first round of the men’s main draw on Wednesday, March 25. The 2015 Miami Open will be played March 23-April 5 at the Crandon Tennis Center in Miami. The two-week combined event is owned and operated by IMG. 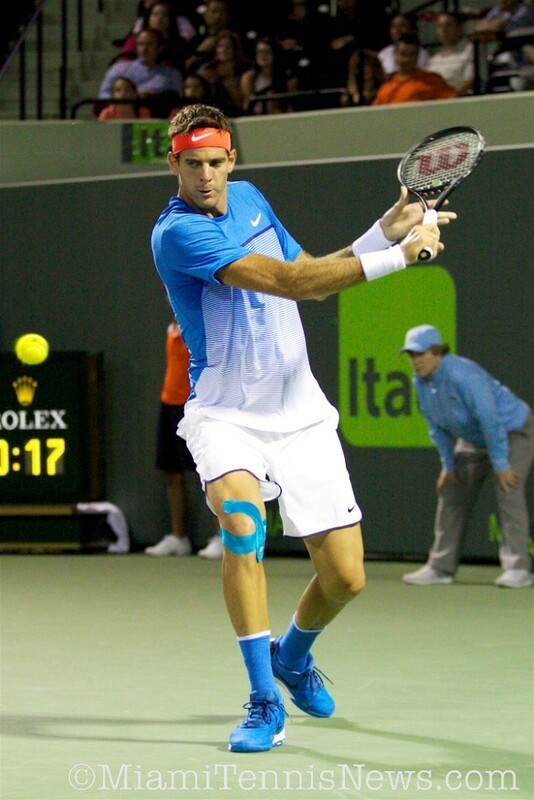 The Miami Open is one of nine ATP Masters 1000 Series events on the ATP calendar, a Premier Mandatory event on the WTA calendar, and features the top men’s and women’s tennis players in the world. The tournament is widely regarded as the most glamorous on the ATP and WTA calendars because of its exotic Miami location, thriving nightlife, five-star hotels and restaurants, beautiful weather and beaches, and its celebrity appeal. 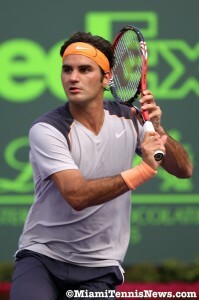 For ticket information, call +1.305.442.3367 or visit www.miamiopen.com.